AMC Theatres has eliminated their free MovieWatcher rewards program and replaced it with a fee-based program they are calling AMC Stubs. I could make an argument both for and against loyalty programs. At their core, loyalty programs try to motivate more frequent customer traffic and increase spending during each visit. A loyal customer is more than just a card-holder. A loyal customer is looking for something that sets your business apart and makes them feel special. AMC’s MovieWatcher program took a broad stroke toward customer loyalty. As a free program with set rewards, they were able to maximize membership numbers but probably saw it take a long time to reach a point where the program was profitable for the company. I was a member of the MovieWatcher program and it actually did factor into my movie watching decisions. The content (i.e. the movie) was the same if I went to an AMC theater or a different chain. I found myself always looking first to the theater where I could earn rewards. It definitely drove the traffic portion of the equation. Did it increase my spending each visit? Not really. I’m an individual who has a hard time justifying spending $4.50 for a soda that I know is only .99 at the fast food place across the street. Did I redeem my free soda or free popcorn coupon when I received them? You bet! But I wasn’t quick to buy anything else. I can see where they would want to move to a fee-based loyalty program. A fee-based loyalty program really does two things for a company. First, it provides cash up-front and gives a faster return on investment. Second, you’re changing the dynamic of your customer base. Only those customers that are truly committed will want to participate. In an economic climate like we are in today, attracting customers to a fee-based program is a tough sell. Even at the cost of AMC Stubs ($12/yr) customers will look at the benefits of the program to decide if there is enough value to justify the purchase. This is where, in my opinion, AMC missed an opportunity when introducing this new program. My introduction to AMC Stubs came when I received an email that said the MovieWatcher program was being eliminated and a new program was rolling out. As a MovieWatcher member, I could get the first year at 1/2 price. I immediately started to focus on the cost/benefit of the annual fee. Two of the five benefits they listed were what I consider “fluff.” No online ticketing fees (which was already waived as a MovieWatcher member) and something they called “Personal online ticket stub collection.” Who knows what that means but I’m sure there is no value in it. The email made me want to crunch the numbers. It’s really too bad. AMC didn’t want customers thinking about how much is costs to go to a movie. When I did crunch the numbers, I found out I needed to spend $200 at AMC before I would see a return on my $12 annual membership fee. I also did the same thing as many other MovieWatcher members…I jumped on Twitter and professed my disappointment at this new program. To their credit, AMC did respond and ask that I give the program a try. However, my logic response far outweighed my love of movies and the seed of doubt was placed in the minds of potential new loyalty members who may have been reading the stream of upset customer feedback. What’s interesting is that a direct mail piece I received from AMC had the potential to be a really nice, engaging introduction to the program. At the end of the piece it talks about how going to a theater to see movies are about the memories you create while you’re there. The caption talks about how you can start tracking your ticket stubs and relive your movie memories. My guess is that the ticket stub collection is really just an image of a ticket with the movie name, time and place printed on it. How great would it be if tracking your ticket stubs tied into your social media accounts? You could tag the friends that you went with. Add photos of you before and after the movie. (Of course not during!) Even better yet, have a place to post quick video reviews of the movie by you and your friends. If AMC had focused the entire direct mail on the movie-going experience, I’d be mentally planning my next trip to the theater, not fixated on the cost. 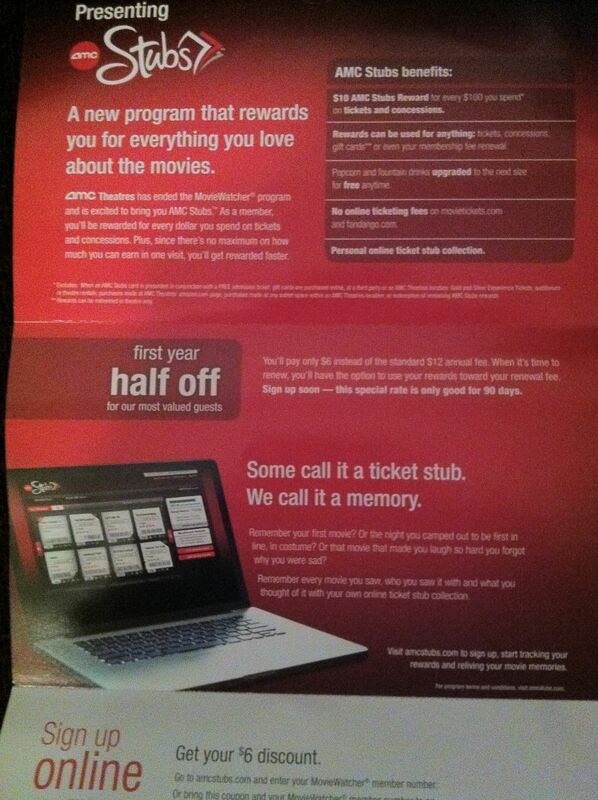 Unfortunately, AMC ruined this direct mail piece by having too much focus again on the cost. They would have been better off focusing on the experience only and having the call-to-action direct the customer into the theater or online where they can sell it. Make the center sections of the theater reserved seating for Stubs members. Let me know my membership is giving me the best seats in the house. Of course it would be when seats are available. If I order my tickets too late, then I know I’ll need to fend for myself in the General Admission area. Let me bring in my own food. There was a time when AMC allowed you to take your own food and drinks into the theater. Bring it back for Stubs members. Odds are, the same people who are smuggling in their drinks and snacks will be willing to spend a minimal amount to “do the right thing.” I’ve felt guilty about sneaking in snacks for my kids and it made me enjoy the experience a lot less. Eliminate the guilt and I’ll keep coming back. Give me a chance to be the first ones to see a movie. Host some AMC Stubs “First Look” events and let me be one of the first to see the hot new release. Then I’ll go online with my review and drive other people to the movie. Integrate your online ticket stub collection with social media sites. I said it before but it’s worth repeating. There is value in emphasizing the experience of attending a movie. Stream some live video of people dressed up and waiting in line for the last Harry Potter movie, let people share reviews (and be creative with it. Set up an app that places the movie trailer for the movie they are reviewing in the corner of the frame so it looks more professional). Focus on letting members share their moments and show that membership has it’s privileges. Who built this toll booth on my information superhighway? I really like your comments. It is interesting that some of the perks you came up with were very similar to ones that I had posted on the AMC FB wall. – Allow Stubs members to pay less for attending opening night movies. – Have access to advance purchase before the regular joe. – Have special sneak previews available for stubs members. – Get to the front of que lines for better seat choice before other non stub patrons. – If customer does not want to upgrade give them a discount on their consession purchase in addition to what you are already offering on your current stubs program. Hopefully AMC will see the light and modify the stubs program to reflect. You should take a look over at their FB page and see the level of negative comments about the program from those who have done the math as well. Mark, thanks for your comments. I haven’t been to AMC’s Facebook page but it’s definitely something I will check. I like your idea of giving a discount on concession purchase if the customer doesn’t want to upgrade their drink or popcorn. Based on the feedback I was seeing on Twitter, there’s a vocal group that is not a fan of the changes. One of the benefits of social media is that the average consumer has a voice with companies. I would like to see some changes but it ultimately comes down to what goals AMC is trying to achieve with this program. Someone over at another FB wall; “Bring back the AMC MovieWatcher Card” posted this link http://latimesblogs.latimes.com/entertainmentnewsbuzz/2011/03/amc-entertainment-unveils-ipo-plans.html as a possible reason for the change. I am not sure I buy that idea but it does make you think about all of their driving motives.